Is your PC Causing you Musculoskeletal Disorders? Laptops, PCs tablets etc. – we all use them at work, at home and on the move; they have become almost like another vital organ we can’t live without. The impact of not managing our health when using DSE can have a significant effect on the quality of our life resulting in living with muscular aches and pain affecting all areas of our body. Have you ever suffered from painful conditions like tennis elbow, or carpal tunnel syndrome? These conditions can be caused or aggravated by DSE use. This is typically due to the individual using the laptop, for example, having their arm or wrist in an awkward position, or simply due to the high repetition of hand and finger movements when keying or using the mouse (some speed typing websites have unofficial records of over 174 words per minute over a 50 minute period!!). Tension in the neck and aching shoulders could be caused in a similar way. At work, ensure that a DSE assessment is carried out on your workstation to identify how arm and hand position can be improved. Your employer is legally required to do this if you use DSE as a substantial part of your work. Make sure you have frequent short breaks from keying continuously. Do a few simple arm, shoulder and neck exercises regularly throughout the day. Consider how much you use your computer or laptop at work AND at home in a day. If it can’t be avoided or limited at work, try to limit your use at home. Ever wondered why your back aches when sitting and using DSE? 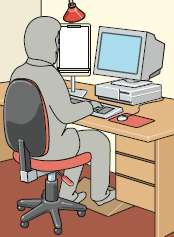 People often do not give much thought to how they are sitting when using DSE as they tend to be concentrating on the screen. 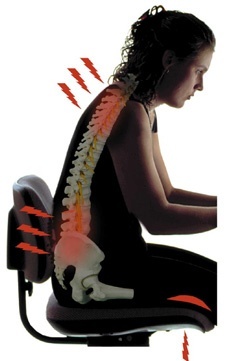 But the seated position can put a lot of strain on the spine typically resulting in low back ache. The natural curve of the lumbar spine is flattened when you sit down, and we often twist and bend the spine to reach items on the floor or perhaps at the back of the desk. At work, the DSE assessment mentioned above will also identify whether your seated position can be improved. Most DSE users can find the correct position using a standard office chair with adjustable features. Occasionally, a special chair may be needed. Get to know your chair – all its features and how to make adjustments. Sometimes people find out after years of using a chair that the lumbar support is adjustable, or that the armrests can be altered. Make sure that you always sit with your spine against the contours of the chair back, and adjust the seat height, back tilt etc. every time you sit in a different chair. Try to find reasons to stand up every now and again to aid circulation and help prevent stiffness and discomfort. Does using a screen make your eyes sore or tired, or give you headaches? When you are concentrating on the screen you blink much less than normal, and this can cause your eyes to become dry and sore. It can especially be a problem for people who wear contact lenses. Additionally, any glare or reflection on our screen can cause your eye muscles to have to work harder to see and they will fatigue more quickly. Any temporary strain on your eyes can result in a headache. At work, the DSE assessment already mentioned may identify how simple changes to the screen position may remove any glare or reflections. Be more aware of how often you are blinking when concentrating on your screen, and try to blink more frequently. Try to include breaks away from your screen into your work; even looking across the room or out of a window can relax the eye muscles. Consider using artificial tears if you are a contact wearer, or perhaps wear glasses for work. If these simple measures do not relieve your symptoms when using DSE at work, request an eye and eyesight test from your employer. They are legally bound to provide one for employees who use DSE for a substantial part of their work, and to provide basic frames and lenses if the test shows you require them for your DSE work. In the workplace, our employer has a duty to ensure that our workstation has a DSE assessment carried out which should highlight any areas of concern and how to resolve them. Employers should have information available which will inform you of all their procedures for the assessments, eye and eyesight tests etc. However, whether at work or at home there are simple actions that you should also consider to help minimise the risks of getting any health problems. Imagine how much you were using computers, laptops, tablets 10 years ago to now; clearly our time spent on all digital devices will only increase so make sure you and your family stay healthy when using them! More Help on DSE or Manual Handling?